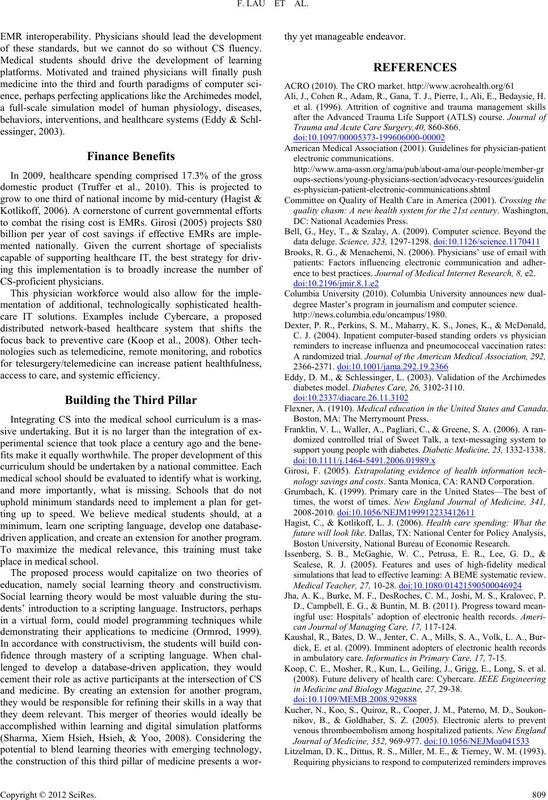 cific computer science (CS) curriculum as the third of Abraham Flexner’s pillars of medical education. CS in research and clinical problem solving. empirical science relied on observations and empirical data. present-day models of physiology and disease. 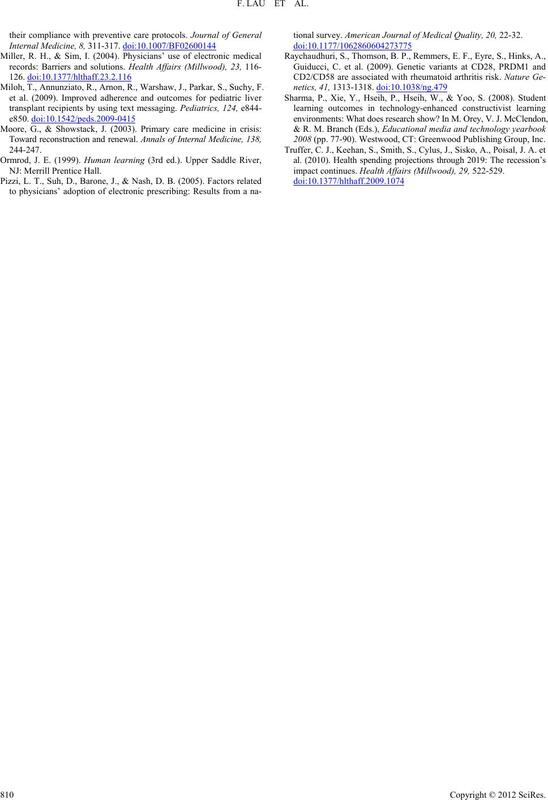 potentially dangerous clinical trials (E ddy & Schle ssinger, 2003). of patient care settings make fourth paradigm tools a necessity. & Tierney, 1993). These systems have been available for years. and electronic prescription systems. But adoption remains slow. port (Miller & Sim, 2004; Pizzi, Suh, Barone, & Nash, 2005). out significant progress in applying IT to improve patient care. along, we should lead these efforts. crucial task for phy sicians. processes are easily reproducible and do not require a patient. thinking at an accelerated rate and in a safe setting. to program their own simulations using these platforms. yielding a comprehensive educational library. (Kaushal, Bates, & Jenter, 2009). are oft-cited barriers to the adoption of email communications. brought for medical advice given via email. fied (Raychaudhuri et al., 2009). of these standards, but we cannot do so without CS fluency. access to care, and systemic efficiency. driven application, and create an extension for another program. education, namely social learning theory and constructivism. demonstrating their applications to medicine (Ormrod, 1999). Ali, J., Cohen R., Ad am, R., Gana, T. J., Pierre, I., Ali , E., B ed aysie, H.
Trauma and Acute Care Surgery,40, 860-866.
ence to best practices. 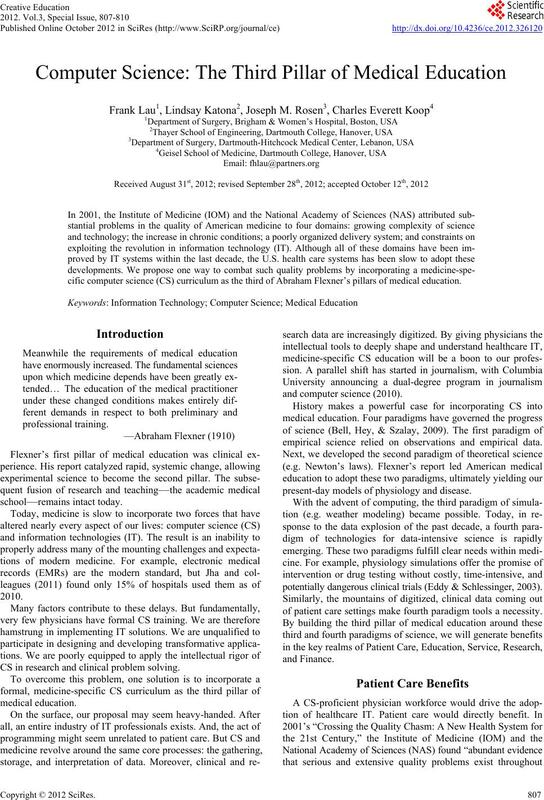 Journal of Medical Internet Research, 8, e2. degree Master’s program in journalism and computer science. diabetes model. Diabetes Care, 26, 3102-3110. Flexner, A. (1910). 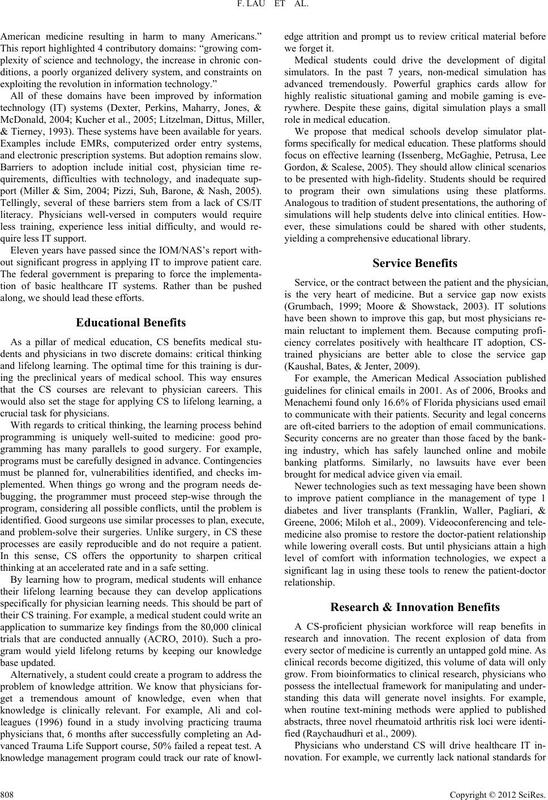 Medical education in the United States and Canada. Boston, MA: The Merrymount Press. support young people with diabetes. Diabetic Medicine, 23, 1332-1338.
nology savings and costs. Santa Monica, CA: RAND Corporation. Boston University, National Bureau of Economic Research. simulations that l ead to effective le arning: A BEM E s ystematic review. Jha, A. K., Burke, M. F., DesRoches, C. M., Joshi, M. S., Kralovec, P.
can Journal of Managing Care, 17, 117-124.
in ambulatory care. Informatics in Primary Care , 17, 7-15. Koop, C. E., Mosher, R., Kun, L., Geiling, J., Grigg, E., Long, S. et al. in Medicine and Biology Magazine, 27, 29-38. Litzelman, D. K., Dittus, R. S., Miller, M. E., & Tierney, W. M. (1993). Miloh, T., Annunziato, R., Arnon, R., Warshaw, J., Parkar, S., Suchy, F.
tional survey. American Journal of Medical Quality, 20, 22-32. 2008 (pp. 77-90). We stwood, CT: Greenwoo d Publishing Group, Inc.
impact continues. Health Affairs (Millwood), 29, 522-529.